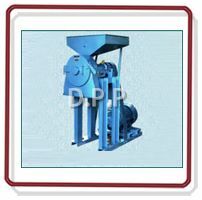 D. P. MINI PULVERISER The D. P. Mini Pulveriser comparises of a heavy duty Mild Steel/Stainless Steel body, which comprises of a feeding hopper, with a feed regulator slide. The pulveriser body is inlaid with a delivery trough attached at the bottom, with a delivery trough attached at the discharged end. The rotor & beater are mounted on shaft, running in a ball bearing housing at a speed of 4500-6000 R.P.M. The whole unit is mounted on a strong steel channel stand. 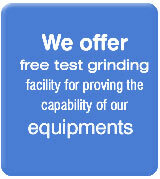 The D. P. Mini Pulverisers are widely used for grinding of both dry/wet spices, green chilly, fresh ginger, garlic, fresh fruits, vegetables. These machines can also be used as a fruit finisher. 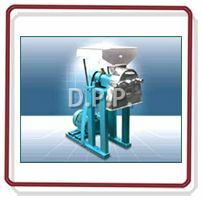 The D. Mini Pulveriser can also be used for the following dry applications like agricultural chemicals, broken biscuits (hi-fat/low fat), custard powder coffee, charcoal, dals, dyes & pigments, fillers, henna leaves, herbs, leaves and roots instant foods insecticides and pesticides, kaolin moulding powders, pharmaceuticals, plastics, poultry feed & marine feed, resins, sugar (biscuit grade/icing grade), stearates, tea etc.